The Cultural Foundation of Harrison County is excited to continue to encourage the development and appreciation for all art forms again in 2019! Programs offered through the Foundation’s funding results in not only cultural growth in Harrison County but they are an economic driver in the local area as well. Two of its “Grand Performances” for the season remain to be held at the new Robinson Grand Performing Arts Center in Clarksburg in 2019. The organization will feature Vox Fortura on March 17th and The Abrams on April 28th. However, February brings the return of the Cultural Foundation’s popular ‘Ivory Evenings’ that will be presented in collaboration with the Clarksburg-Harrison Public Library. This first Ivory Evenings of 2019 will be held at the historic Waldomore in Clarksburg at 2 p.m. on Sunday, February 17th and will be an enjoyable afternoon, particularly for those who enjoy classical music! The program will feature two talented musicians who, together, will offer works by Johann Sebastian Bach, Samuel Barber and Astor Piazzolla. Ashley Driscoll, a graduate student at WVU studying Cello Performance and Orchestral Conducting, will make up half of the musical duo on cello – with Kyle Linscheid displaying his ‘gift’ on the piano. Driscoll is currently the graduate assistant conductor of the WVU Symphony Orchestra and has been the guest conductor for West Virginia String Day and WVU Cello Day. 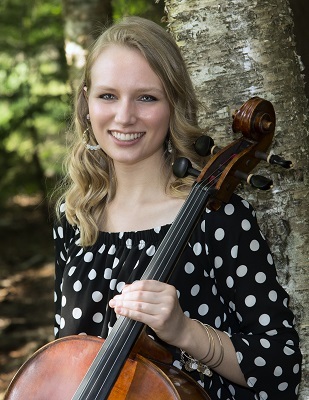 Holding undergraduate degrees in Music Education and Cello Performance, Ashley has presented master classes to public schools in West Virginia and Ohio and has taught elementary through high school band and strings in both Clarksburg and Wheeling. As a string pedagogy enthusiast, Ashley has attended the Paul Rolland String Method Workshop and The Ohio State String Teacher Workshop. Most recently, Ashley was a Strings Teaching Assistant at the 2018 interlochen Arts Camp in Michigan. Kyle Linscheid received his undergraduate degree in Music History and Literature from Wheaton College and earned a Master of Music degree in Piano Accompanying and Chamber Music from the prestigious Eastman School of Music. Upon completion of additional postgraduate study with pianist Lee Luvisi, Linscheid served as staff accompanist at the University of Louisville School of Music; he has also served as staff pianist for The Quartet Program and the South Carolina Governor’s School for the Arts in recent years. He has collaborated extensively with UNC-Charlotte violinist David Russell, and together they have performed numerous concerts in the U.S., Canada, France, Portugal, and Spain. Linscheid makes his home in Morgantown, WV where he collaborates as a pianist within the WVU music community. Funding to support concerts such as these are garnered from grants, donations, Cultural Foundation memberships, business sponsorships and of course from the generous endowment from the Barbara B. Highland Fund for the Arts. Although tickets must be purchased for the Grand Performance presentations, Ivory Evenings concerts are free and open to the public. For more information on ‘Ivory Evenings’, please contact Waldomore at (304) 627-2236 ext. 121 or visit clarksburglibrary.info.